Hedge funds hit another rough patch as the first quarter of 2014 drew to a close, giving back part of their February gains to finish the month down 0.35%1, with the MSCI World Index2 returning a flat 0.04% during the month. Global markets remained largely flat-to-negative during the month as better than expected US jobs data and the reduction of the Fed’s monthly asset purchase program by another US$10 billion heightened concerns that US interest rates could rise faster than previously anticipated. Investor sentiment improved towards the month-end as Fed chairperson Janet Yellen shifted the focus of her ‘forward guidance’ away from an unemployment target towards a more qualitative improvement in the US labour market – a move that will give the Fed more flexibility to influence rates until a sound economic recovery is ensured. Meanwhile, European markets trended downwards as fears over disinflation resurfaced in the Eurozone, while in Asia, markets declined on news of disappointing PMI data from China and an impending sales tax hike in Japan. Emerging economies continued to show signs of stability with the MSCI Emerging Market Index3 advancing 1.69% during the month as major emerging market currencies stabilised. 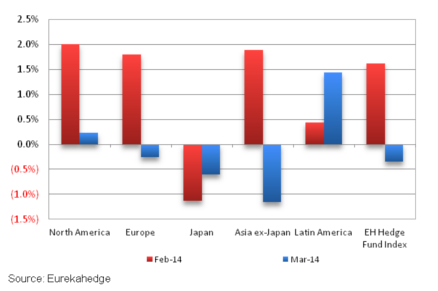 Hedge funds focused on the Americas ended the month in positive territory, led by Latin American funds which were up 1.44%, but underperforming the MSCI Latin America Index4 which gained 5.56% during the month. North American managers were the only other regional mandate in positive territory, returning 0.23% as the MSCI North America Index5 climbed 0.38%. European funds suffered losses of 0.25%, while Asia ex-Japan funds were down 1.16%, attributing much of their losses to funds with a Greater China mandate.